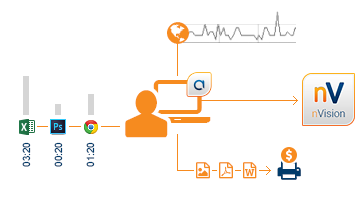 Axence nVision software collects and monitors a lot of detailed information from your company networks. The most advanced functions, allowing for the inventory of IT assets to be carried out or user activity to be monitored, among other features, additionally employ the so-called nVision Agents. These are small programs running as services on monitored machines. Want to know about all the pendrives and disks used by the users in your network? Want to know what they copied? Want to assign access rights? The remote access function is available through the Internet, routers and NAT. Is it safe to use the Agents? All information sent by the Agent is secured with a 256-bit key. The database is also password protected. What network traffic is generated by Agents? 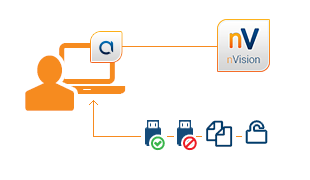 All data are compressed before sending and uncompressed after reaching nVision. Agents send small packages every few hours. Mean daily traffic generated by a single Agent is approx 100kB. What resources does an Agent have? An Agent stores approx. 30 - 50 MB of data. CPU usage should be very low (0 - 5%), up to 15%. How to install nVision Agents? Once installed, the Agents will update automatically. You will be able to uninstall them anytime with the nVision console. Find out more about Axence nVision Agents in "Axence nVision – User Manual"